Home All RayZor Sunglasses Rimless Sunglasses VENTZ: RAYZOR WHITE FRAMED SPORTS SUNGLASSES WITH A 1 PIECE VENTED BLUE IRIDIUM MIRRORED ANTI GLARE LENS. Lightweight White Frames Manufactured from a Shatterproof Polycarbonate Compound, With Blue Rubber Head Grips and a Blue Nose Pad. 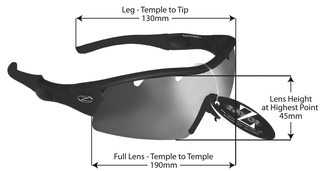 Very happy with these sunglasses, not just good for cricket which I play but also for cycling, rowing and general use! Comfortable fit, look brilliant and personally I think excellent quality for the price. I couldn't decide which colour of lens to get for the new season, so I bought two. Good secure fit. Best of all they don't fog up. Protect your eyes...get a pair of RayZors.